You are currently browsing the tag archive for the ‘novella’ tag. I first heard of this novella in a “best of 2011” list by a notable publication (sorry, tried to look for it, with no success). That article invited a number of prominent authors to choose their yearly favorites and Train Dreams was recurrent, even though up to that point I’d never heard of it. Actually, I must shamefully admit that I hadn’t even heard of Denis Johnson, although it seems he’s considered “one of the nation’s [USA] best novelists”. Since then Train Dreams became more famous for being on the Pulitzer’s short-list in a year when the judges couldn’t reach a decision and the award wasn’t given. Train Dreams started as a short-story in The Paris Review, but it ended up a novella that deserves to be read in one go, when your concentration isn’t distracted by something else. The story is simple: the life of Robert Grainer, one of the thousands of hands that built the American West at the beginning of the 20th century. Grainer is a good man, a simple man, honorable, introverted, hard-working. Throughout his long life he sees modern-day America take shape – the T-Models, the railway, airplanes – but also witnesses the enduring strength of the West’s myths, mostly of Native American origin. I can’t say there was any particular turn of phrase that caught my eye, but there were several scenes I kept going back to for days after finishing it. Grainer’s life is told in a series of more or less disjointed episodes, but it develops into a tight glimpse into the life of itinerary workers. It’s hard to pin-point why the novella feels so intense when the tragedies and good fortunes of its characters are told so matter-of-factly (it reminded me of Ian McEwan and William Faulkner). There’s a clever eye for the weird detail, an effective capture of the historical period, and a continuous sense of wonder at nature and the stranger-than-fiction episodes we all face at some point. All his life Robert Grainier would remember vividly the burned valley at sundown, the most dreamlike business he’d ever witnessed waking—the brilliant pastels of the last light overhead, some clouds high and white, catching daylight from beyond the valley, others ribbed and gray and pink, the lowest of them rubbing the peaks of Bussard and Queen mountains; and beneath this wondrous sky the black valley, utterly still, the train moving through it making a great noise but unable to wake this dead world. Some scenes made me laugh out loud (conversation in the horse cart with the almost-dead), choke up (the biplane ride) and get goose bumps (the wolf pack’s visit). It surprised me that a story written so simply could be so evocative. 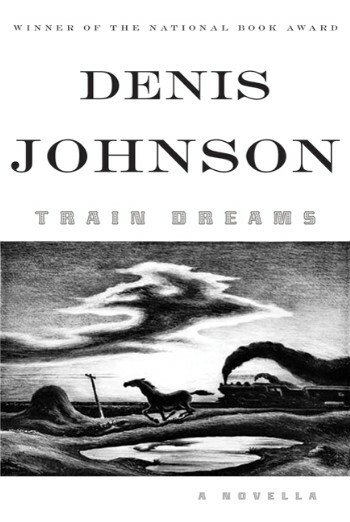 Anyone has any recommendation for other good Denis Johnson’s?